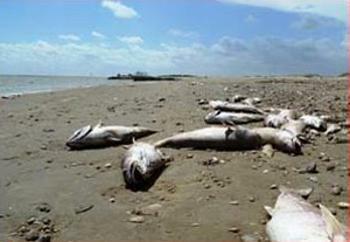 GALVESTON, Texas, August 13, 2012 (ENS) – Thousands of dead fish that washed ashore on Galveston Island over the weekend were killed by a toxic algal bloom, state officials confirmed Monday. The Texas Department of State Health Services said a bloom of Karenia brevis, also known as red tide, was found in Galveston Bay in concentrations high enough to kill the fish. Texas Parks and Wildlife Department officials began receiving reports of fish kills on Friday. The reports were from Quintana Beach to the mouth of the Colorado River and included mostly Gulf menhaden, also called shad, with a few mentions of gafftopsail and hardhead catfish. Additional fish kills were reported over the weekend at Surfside Beach and Galveston; samples were collected from the Surfside jetty and San Luis Pass to look for Karenia brevis. In addition, fishermen reported coughing and dead fish 4 miles offshore of Galveston. Dead flounder and stingrays have been reported at Kemah and Bacliff. Biologists originally thought that low oxygen levels were to blame, so additional investigations were conducted to determine if K. brevis was, in fact, the cause. On Sunday, the Texas Health Services biologists found varying levels of K. brevis in their sampling and officials then closed the following several areas of Galveston Bay to shellfish harvesting. State officials are still investigating this event. Weather permitting, Texas Parks and Wildlife officials intend to conduct a coastal overflight later this week to get an aerial view of the bloom. In Galveston, Parks Board Executive Director Kelly de Schaun told reporters crews worked overnight to clean the beaches most frequented by the public and the western end of the island, which had the largest concentrations of dead fish. A second, smaller wave of dead fish arrived Monday morning and was removed, she said. Crews must clean the entire 32 miles of island beachfront, which is likely to take until Wednesday, de Schaun said. In 2011 a red tide covered most of the Texas Gulf Coast and Galveston Bay, closing oyster beds to harvesting. K. brevis produces a toxin that affects the central nervous system of fish so that they are paralyzed and cannot breathe. As a result, red tide blooms often result in dead fish washing up on Gulf beaches. Three common signs of a red tide bloom are discolored water, dead fish and breathing difficulty, according to state health officials. Jack Ralph, former head of the Texas Parks and Wildlife Department’s Kills and Spills Team said it may not be necessary to cancel a trip to the Texas Gulf coast just because of a red tide. It’s usually okay to eat fish, crabs and shrimp during a red tide bloom because the toxin is not absorbed into the fleshy tissues of these animals, says the Texas state health department which adds that people should never eat fish found sick or dead, whether or not they are caught during a red tide. Sightings of dead fish or suspected red tide can be reported 24 hours a day to Texas Parks and Wildlife Department officials communication centers; call 512-389-4848 in Austin or 281-842-8100 in La Porte.